BT boss Gavin Patterson may have launched the opening salvo in a UK 5G marketing battle with his revelation that BT plans to introduce a 5G service next year. Mike Sherman, who joined BT Group plc (NYSE: BT; London: BTA) as strategy director from Boston Consulting Group in March this year, has been tasked with developing BT's 5G strategy, while technology boss Howard Watson will have responsibility for building the network. A commercial launch in 2019 could make BT the first of Europe's major operators to bring 5G to market. It might equally trigger a response from UK mobile rivals including Telefónica UK Ltd. (trading under the O2 brand), Three UK and Vodafone Group plc (NYSE: VOD). 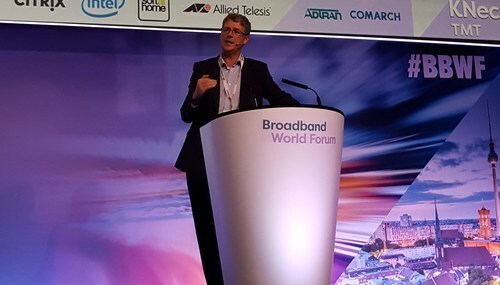 BT's Howard Watson, seen here presenting at last year's Broadband World Forum in Berlin, has been given responsibility for building the operator's 5G network. EE, the mobile operator that BT acquired in early 2016, was able to build a lead in the UK's 4G market after regulatory authorities gave it a head start over rivals with the early award of 4G spectrum. BT will not have the same advantage when it comes to 5G. Each of the four mobile network operators picked up 5G frequency licenses during a recent spectrum auction. BT's competitors will be keen to ensure they are not left behind in the battle for the first 5G customers. That said, operator marketing has traditionally focused on network capability and sophistication, and consumers are typically drawn to the latest and greatest technologies, whether new iPhone models, 4K TVs or the next G from a telco. The cost efficiency that operators associate with 5G could also support the launch of "unlimited" data tariffs, giving customers an incentive to upgrade from 4G. Although there seems more potential for sales growth in using 5G to support new services for business customers, BT has indicated that its initial focus will be on providing a connectivity boost. "We're confident the first application will be enhanced mobile broadband," said Watson during BT's earnings presentation. "The key thing in terms of deploying 5G is ensuring we have a great 4G starting point. We have had success through EE in building up a great base and are pleased with our success in recent auctions in terms of acquiring initial spectrum." The operator this week said it would invest £3.7 billion ($5 billion) in capital expenditure in the current fiscal year, up from £3.5 billion ($4.7 billion) in the previous one, as it bolsters investments in both fixed and mobile networks. Besides extending 4G infrastructure, BT plans to bring all-fiber connectivity to around 3 million UK premises by 2020. Those networks could reach 10 million homes and businesses by 2025, says Patterson, if regulatory conditions prove favorable. While the initial focus of a commercial launch is on enhanced mobile broadband, BT is exploring the development of low-latency applications, said Watson. "Over the next two years, we will start to develop a business case for that," he said. 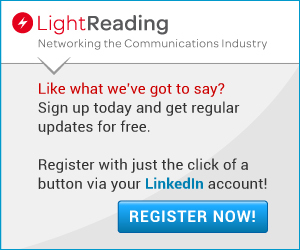 "Part of the new capex guidance is about getting the network ready for 5G."